The archival collections of the Pritzker Legal Research Center document the history of Northwestern Pritzker School of Law since its establishment in 1859 to the present day. Materials in these collections focus on the non-administrative life of the Law School and include (but are not limited to) newsletters, photographs, programs, moot court briefs, promotional literature, and past examinations. Materials relating to the administration of the Law School, such as the records of its deans, faculty, staff, and students, are typically annexed into the Northwestern University Archives. If you have any questions or would like to see some materials, please contact the Special Collections, Digitization, and Archival Services Librarian. The Arthur J. Goldberg papers span the years ca. 1961-78 and fill 42 document boxes. 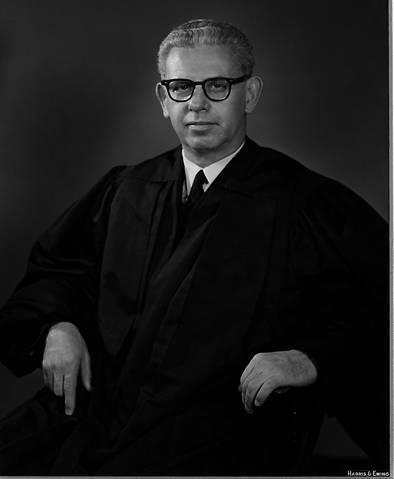 The papers consist primarily of Supreme Court case records from the Court's October Terms, 1962 through 1964. The remaining records pertain to Goldberg's administrative affairs while on the Court, and to his involvement with numerous community organizations, civil committees, and scholarly institutions. The records are arranged in four categories: biographical materials, Supreme Court case records, Supreme Court administrative records, and general subject files. Selected papers from this archive were digitized by the Pritzker Legal Research Center with a grant from the Illinois State Library. Users can view digitized papers online either as images or as PDF files. Users can also search the papers by term, docket number, genre, or date, and can browse using a list of cases. The collection can be found online here.